Raise your hand if your weekly dinner menu includes chinese carry-out. I’m raising mine! 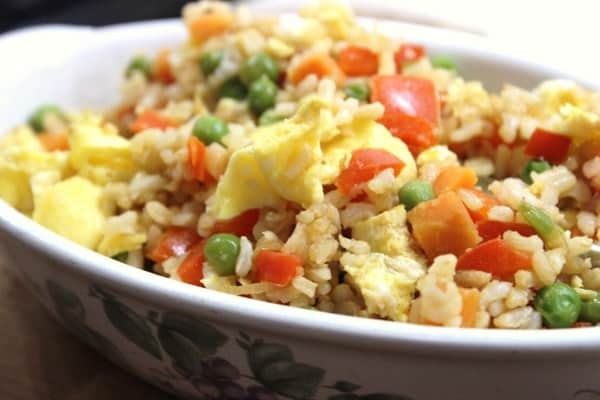 In our house, when we order chinese food, we always order a variety of things, but one thing that remains the same on our weekly order is fried rice. Mmm Mmm! Love it! BUT, it isn’t the most healthy thing on the menu that you can order. As a matter of fact, most things on a chinese carry-out menu aren’t very healthy, unless you order from their steamed, diet selections, which is usually what I do, believe it or not. I actually prefer it. 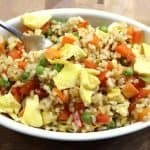 When I found this recipe in my Weight Watchers Weekly for Healthy Veggie Fried Rice, I immediately set it aside for my next grocery shopping trip. 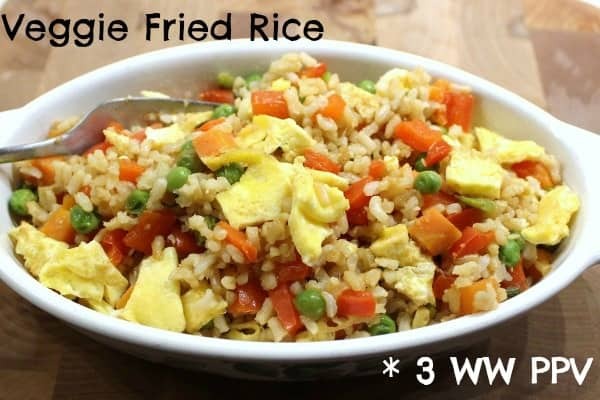 This particular recipe doesn’t include any meat, but if you add some steamed shrimp or grilled chicken, it wouldn’t add too many more Weight Watchers points. And at a 3 Weight Watchers Points Plus Value, you can afford to add some extras. Coat a large nonstick skillet wwith cooking spray; heat over medium heat. Add egg and swirl to coat pan; cook egg through; remove to a plate, and break egg up into small pieces with a fork. Off heat, recoat skillet with cooking spray. 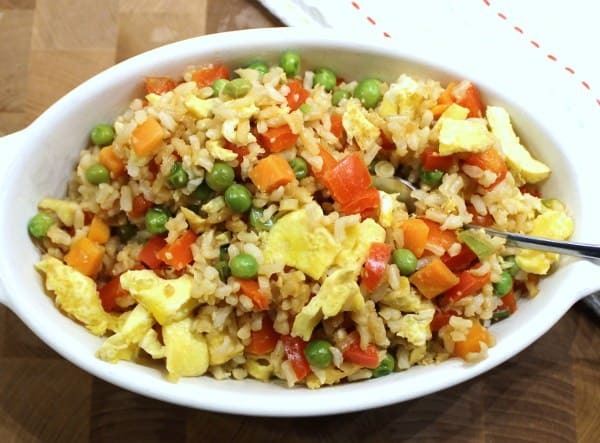 Add scallions, pepper, peas and carrots, garlic, and ginger to skillet; saute for 5 minutes. Stir in cooked egg, soy sauce, and rice wine vinegar; serve. This recipe was very easy to make. At first I thought one egg wouldn’t be enough, but it was plenty. One ingredient that I will omit the next time I make this recipe is the red peppers. I’m not a huge red pepper fan, especially cooked vs. raw. 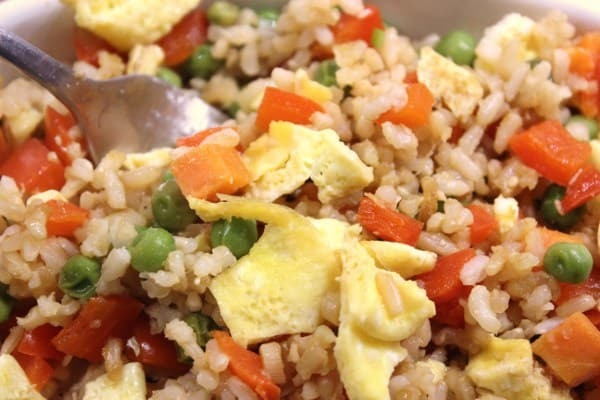 Plus, how many chinese restaurants put red pepper in their fried rice? It just didn’t seem very authentic to me. And as I mentioned earlier, I would definitely add some steamed shrimp, grilled chicken, or even some tofu to ramp up the protein and make it a completely satisfying meal. Lastly, the spring onions didn’t have a strong enough taste. 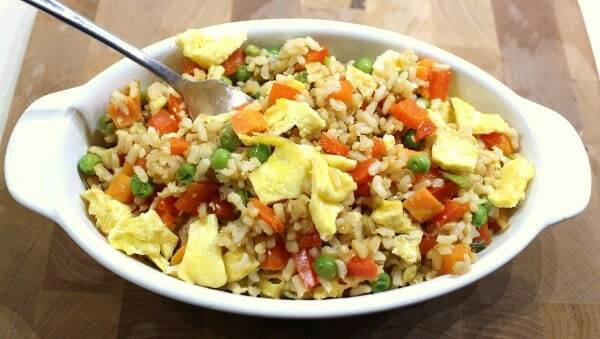 I love crisp cooked onions in fried rice, so next time I’ll add some diced yellow onions to it as well. Add a few dashes of soy sauce and you’ve saved yourself a call to your local chinese restaurant. Yum, the pictures made me want to lick my computer screen!!! I’ve never used brown rice when I make fried rice. I will definitely try it!! LOL! It really was good Cheryl. I would add shrimp and onions to it next time I make it – and omit the red peppers.